When we think of heroes, a number of names come rushing to the mind, but only a few of them have been spoken of in as many incarnations as the mighty half-god of Greek mythology, Hercules! Whether he’s an animated youngster eager to prove himself to his fuzzy mentor or a long-haired and suave friend-to-all on a legendary adventure, the guy has it all! Strength, a winning smile, notorious combat proficiencies, and… did we mention half-god? Hard to compete with that one! Sure, several of the ancient tales of Hercules don’t have the best of beginnings… or endings, honestly, but you have to give credit to a guy who can keep his chin up despite having a rather grumpy step-mother and uncle full of underworld angst. Between tackling ferocious monsters birthed from Echidna and winning the heart of a few Grecian lasses, Hercules has countless tales to be told. 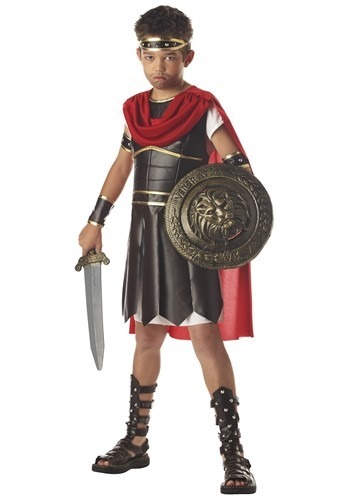 And, this year, the stories can continue when you don your kiddo in this Child Hercules costume. A comfortable white pullover tunic starts the look and you can armor your child up, next, with the foam body armor and attached cape. You won’t have to spend all day gearing your kid up, either, thanks to an easy fabric tie in the back of the armor. (Now, why didn’t the ancient Greeks think of that!?) Warrior-like armbands and leg guards close with Velcro and ensure that your child will be protected from all manner of monsters, but it might be a good idea to pick up a nice sword and lion-emblazoned shield just to make the beasties think twice about trying your demigod! The only question that remains is to figure out which of the kiddo’s parents is the god!